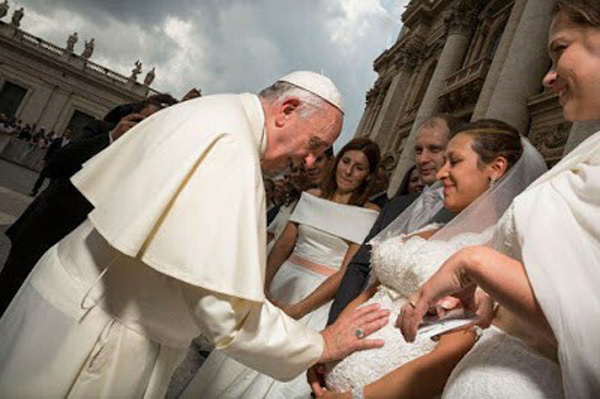 Pope Francis is establishing the distasteful custom of touching and blessing the wombs of pregnant women whose marriages take place in the Archdiocese of Rome. The newlyweds come to meet him and receive his blessing either in St. Peter's Square or at Paul VI Hall in the Vatican, as shown in the photos on this page. One can argue that no man should touch the womb of a pregnant woman except for her husband and her doctor. Certainly no Prelate should do so, and especially if he is a Pope. For any man such an act goes against decorum and good customs. For an ecclesiastic or religious men it also violates the rule of touching (here and here) in force in the Catholic Church until Vatican II. However, our point here is not just this. When the Pope blesses the pregnant womb of a woman who is just getting married, he is also blessing her previous sins against chastity that produced the pregnancy. That is, he is approving and encouraging pre-marriage cohabitation. Now then, this papal action frontally opposes Catholic Morals, particularly the Sixth Commandment. In brief, Francis is promoting sin and, consequently, giving public scandal. This is inconceivable for a Pope, whose mission is to confirm the faithful in the Catholic Faith and Morals. Now, we ask: What efficient measures can the coming Synod take against pre-marriage cohabitation when the Pope is already approving it? Many conservative Catholics, who are correctly calling for a less revolutionary Synod, refuse to see that Francis has already opened the moral dikes, no matter what the future Synod says or does.